By Jimitota Onoyume, Levinus Nwabughiogu & Joseph Erunke ABUJA—Nigerian troops of Operation Lafiya Dole, during investigation of arrested suspected Boko Haram terrorists in Borno State, have discovered one of the abducted Chibok school girls, Rakiya Abubakar, with her six months old baby in Alagarno in Damboa Local Government Area of the state. Meanwhile, President Muhammadu Buhari has expressed happiness over the recovery of Rakiya Abubakar. In a statement by his spokesman, President Buhari, said the recovery raises renewed hope that the other abducted girls will one day be reunited with their families, friends and community. 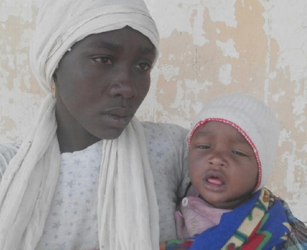 President Buhari also “commended the military for the diligent investigation which led to the recovery of Rakiya and urged them to continue in the spirit with which they cleared the Sambisa forest of terrorists.” ADVERTISING inRead invented by Teads Newly found Chibok girl, Rakiya Abubakar and her baby He “assured that the Nigerian Government will continue to do all within its powers to assist the military in locating the rest of the girls and eradicate the menace of terrorism in Nigeria.” The recovered Chibok girl A statement by the Director, Army Public Relations, Brigadier General Sani Usman, yesterday, in Abuja on the recovered young woman, said after a preliminary investigation, “it was discovered that she is the daughter of Abubakar Gali Mulima and Habiba Abubakar of Chibok.” The recovered school girl “further stated that she was a student of Senior Secondary School Class 3B (SS 3B), before her abduction along with her colleagues on April 14, 2014 by the Boko Haram terrorists.” The statement said Rakiya Abubakar is presently undergoing further medical investigation and would soon be released to the Borno State Government. It will be recalled that 21 Chibok schoolgirls abducted by Islamist Boko Haram insurgents, were released to the Nigerian government on October 13, 2016. The girls were picked up by military helicopter from Banki area of Borno State, where Boko Haram militants dropped them off earlier that day. It had earlier been reported that the girls were freed in a swap for detained Boko Haram leaders, a claim government denied. The girls were among the 219 students abducted by the insurgents in Chibok, Borno State, on April 14, 2014. One of them, Amina Ali Nkeki, had earlier this year, escaped from the abductors’ grip and was received by President Buhari at the Presidential Villa, Abuja. Meanwhile, Director of Defence Information, Brigadier General Rabe Abubakar, has reiterated that Boko Haram has been wiped out in the North East, stressing that there was no way the Islamist terrorist sect could regroup to wreak havoc in the region. General Abubakar, who spoke at a media parley with journalists in Port Harcourt, Rivers State, yesterday, called for vigilance, noting that some escapees of the terrorist group could be struggling to infiltrate communities. He said the few attacks by the group recently were carried out by fleeing remnants of the sect. “Boko Haram is gone in Nigeria and it has gone for good. There is no Jupiter that can bring Boko Haram. What we are doing is to only sensitise citizens on the need to alert us on fleeing Boko Haram members. “Boko Haram and all its apparatus have been completely destroyed. Boko Haram members are in disarray and that was why we issued a statement, last week, that due to the ongoing crackdown on Boko Haram, some escapees may try to integrate into the communities,” he said. The Nigerian Army have announced on Thursday, January 5 that its troops stationed in the North-East rescued another of the missing Chibok schoolgirls. Sani Usman, a brigadier general and the Army spokesperson, who made the announcement on his Facebook Page Thursday afternoon, promised to provide details of the development later. Meanwhile, President Muhammadu Buhari has expressed happiness over the recovery of Rakiya Abubakar. In a statement by his spokesman, President Buhari, said the recovery raises renewed hope that the other abducted girls will one day be reunited with their families, friends and community. A statement by the Director, Army Public Relations, Brigadier General Sani Usman, yesterday, in Abuja on the recovered young woman, said after a preliminary investigation, “it was discovered that she is the daughter of Abubakar Gali Mulima and Habiba Abubakar of Chibok.” The recovered school girl “further stated that she was a student of Senior Secondary School Class 3B (SS 3B), before her abduction along with her colleagues on April 14, 2014 by the Boko Haram terrorists.” The statement said Rakiya Abubakar is presently undergoing further medical investigation and would soon be released to the Borno State Government. It will be recalled that 21 Chibok schoolgirls abducted by Islamist Boko Haram insurgents, were released to the Nigerian government on October 13, 2016. The girls were picked up by military helicopter from Banki area of Borno State, where Boko Haram militants dropped them off earlier that day. It had earlier been reported that the girls were freed in a swap for detained Boko Haram leaders, a claim government denied. The girls were among the 219 students abducted by the insurgents in Chibok, Borno State, on April 14, 2014. One of them, Amina Ali Nkeki, had earlier this year, escaped from the abductors’ grip and was received by President Buhari at the Presidential Villa, Abuja. Meanwhile, Director of Defence Information, Brigadier General Rabe Abubakar, has reiterated that Boko Haram has been wiped out in the North East, stressing that there was no way the Islamist terrorist sect could regroup to wreak havoc in the region.